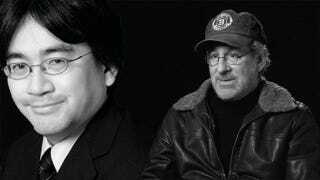 In a transcript for a never-before-seen installment of Iwata Asks unearthed by Nintendo Gamer, the president of Nintendo explains to legendary director Steven Spielberg why it would not be acceptable to put Mario in the fridge. Here at Kotaku we've become big fans of Nintendo Gamer's Iwata Asks parody series, riffing on Nintendo's own interview series by pairing up the executive with some unlikely celebrities and public figures. Figures like British deputy Prime Minister Nick Clegg. Fake Iwata poses the tough questions to fake Clegg, such as why do people dislike his association with UK Prime Minister David Cameron. I prefer Matthew Castle's installment from earlier this month myself, in which Nintendo's boss takes on one of Hollywood's biggest names. Spielberg: That's a little unfair. It's so amazingly dead on I'll never be able to look Iwata in the face without breaking out laughing again. Hit up the links to read the full Nintendo Gamer Iwata Asks saga. There are only two right now, but they've promised us Uggie the Nintendo spokesdog for the next installment. We can't wait.